Protesters gather in Taksim Square in Istanbul on Sunday, June 2. “Democracy does not only mean elections,” President Gul was quoted by the Anatolia news agency as saying on the fourth day of nationwide anti-government protests. “The messages delivered with good intentions have been received. I am calling on all my citizens to abide by the rules and state their objections and views in a peaceful way, as they have already done,” Mr. Gul added. His comments came amid reports of a 20-year-old Turkish man dying when a taxi drove into a group of demonstrators on an Istanbul highway during an anti-government protest. Prime Minister Recep Tayyip Erdogan has repeatedly said that protesters were manipulated by extremist groups and should show their discontent “at the ballot box,” urging them to end their demonstrations immediately. The Turkish prime minister Recep Tayyip Erdogan, pictured with his wife Ermine. The president said the protesters should watch out for “illegal organizations” infiltrating their demonstrations. He warned against actions that would tarnish Turkey’s image. The protests started out as a local environment campaign and quickly turned into one of the biggest demonstrations against Erdogan’s government since it took power a year ago. [Turkey has seen violent demonstrations since Friday, when police launched a dawn raid against a peaceful sit-in protesting plans to cut down trees in Istanbul’s main Taksim Square. Since then, the demonstrations by mostly secular-minded Turks have spiraled into Turkey’s biggest anti-government disturbances in years, challenging Prime Minister Recep Tayyip Erdogan’s power. Earlier, Prime Minister Erdogan dismissed the street protests as being organized by extremists, described them as a temporary blip and angrily rejected comparisons with the Arab Spring uprisings. Appearing defensive and angry, he lashed out at reporters who asked whether the government had understood “the message” by protesters or whether he would soften his tone.”What is the message? I want to hear it from you,” he retorted. “What can a softened tone be like? Can you tell me?” he said ahead of leaving for a trip to Morocco, Algeria and Tunisia. He also lashed out at Twitter, used by many of the protesters. “There is a troublemaker called Twitter, the worst of lies are in there,” he told the Haberturk television channel on Sunday, citing false tweets about attacks against protesters and fatalities. Colombia and leftist FARC [Revolutionary Armed Forces of Colombia] rebels have reached a deal on land reform, one of the most contentious items in negotiations aimed at ending five decades of insurgency. The agreement between Bogota and the Revolutionary Armed Forces of Colombia [FARC] would compensate those who have lost land or were displaced from their property, said Cuban diplomat Carlos Fernandez de Cossio, whose country played host to the months-long negotiations. So far, the talks at the Havana Convention Center have focused almost entirely on land reform – the first of five agenda items to be discussed. 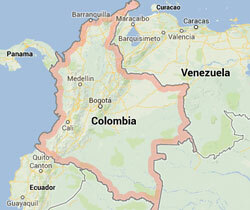 Land distribution was one of the triggers of the protracted conflict in Colombia, where gaping inequality divides wealthy landowners and poor peasants. The agreement on agrarian development “seeks to reverse the effects of the conflict and that the victims of forced displacement and looting obtain restitution,” said Fernandez de Cossio, as he read a joint statement from the parties. The step, the first major advance in six months of peace talks in Havana, was widely celebrated – but it is part of a larger package still being bargained. Both delegations will take a break of several days, and then begin talks on political participation, the second agenda point. They are set to also discuss illicit drugs, decommissioning weapons and how to handle victims of the armed conflict. France will ban electronic cigarette smoking in public places by imposing the same curbs enforced since 2007 to combat tobacco smoking, Health Minister Marisol Touraine said on Friday (May 31). Amid mounting global concern over the public health implications of so-called e-cigarettes, Touraine said they faced the same fate as traditional ones: a ban on smoking in public spaces and sales to minors and a blackout on media advertising. In a country where the pungent waft of Gaulloises and Gitanes once seemed an unassailable part of cafe culture, smokers have long been banished to outdoor terrace seats. The near-odorless electronic alternative – battery-driven devices that allow users inhale odorless nicotine-laced vapor rather than smoke – are gaining ground in no-go zones such as bars, cafes, trains, waiting rooms and offices. A government-commissioned report said this week that around 500,000 people in France had turned to e-cigarettes, which are designed to look like cigarettes although some come in different colors, and recommended a crackdown on public use. Health officials in many countries say the impact of electronic cigarettes on health needs further study. Another worry they cite is that the electronic alternative will increase the general temptation to smoke, including enticing those who have quit to start again, or that smokers may use them alongside rather than instead of regular cigarettes. “This is no ordinary product because it encourages mimicking and could promote taking up smoking,” said Touraine, who announced her plans at a news conference. In the United States, the number of smokers who have tried out e-cigarettes doubled to one in five in 2011 and the number of all adults trying it doubled too, to 6 percent, according to the U.S. Centers for Disease Control and Prevention. In France, a country of 66 million, the government says tobacco smoking kills some 66,000 people a year and another 5,000 are killed through passive exposure to smoke. The expert in charge of the French report advised against an outright ban on e-cigarettes, however, saying they still seemed safer than tar-laden tobacco. Electronic cigarettes, whose invention is widely credited to a Chinese pharmacist a decade ago, usually comprise disposable cartridges of liquid such as propylene glycol that is easily turned to vapor and can contain artificial flavors alongside concentrated liquid nicotine. NOTE: “Answers” emails have ended for the school year. Daily posting will end June 7th and will resume in the end of August. Answers emails will resume September 3rd. b) Until recently, Turkey has had a secular government. What do you think of the protests against an Islamist government in a country that is 99.8% Muslim? c) CHALLENGE QUESTION: What is the historical significance of Turkey to Christians? b) List the 5 agenda items the Colombian government and leftist FARC rebels are negotiating about. c) Which item has been agreed upon – on what condition will this be carried out? 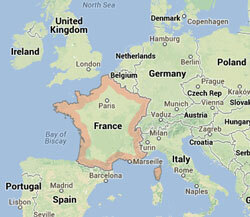 b) What restrictions will be placed on e-cigarettes in France? c) The expert in charge of the French report advised against an outright ban on e-cigarettes, saying they still seemed safer than tar-laden tobacco. What do you think? Should e-cigarettes be banned or should more research be done prior to imposing a ban? Explain your answer. 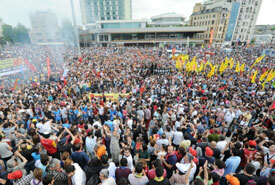 Some of the protesters clashed with police, but most demonstrated peacefully, chanting calls for Prime Minister Erdogan to resign. Those who did not take to the streets banged on pots and pans from windows. There was scattered violence in areas close to Erdogan’s offices in Istanbul and in Ankara. The Dogan news agency said police fired tear gas at one group close to Erdogan’s Istanbul office. The protesters responded by hurling stones. The agency said as many as 500 people were detained overnight Monday after police clashed with more militant protesters and then moved in to break up several thousand people demonstrating peacefully. Turkey’s Fox television reported 300 others were detained in a similar crackdown in Izmir, Turkey’s third-largest city. Social media were awash with reports and videos of police abuse. Authorities have said police excesses would be investigated, but they appeared to continue unabated. Since the 1920s Turkey has been vigorously secular in its public sphere. Now protestors accuse Prime Minister Recep Tayyip Erdogan of blurring the line between religion and state by trying to impose the Islamist values of his Justice and Development party (AKP) on society as a whole. Last month the government introduced a new banning the sale of alcohol between 10pm and 6am and forcing restaurants near schools or mosques to be dry. The government has also tried to clamp down on kissing in public. Some have also perceived a state recommendation that everyone should have three children as too invasive. Unlike in the dictatorships of Egypt, Libya et al, Turkey enjoys free and fair elections. Mr Erdogan has won three consecutive general elections, each time with a greater share of the popular vote. He also has the support of the United States and other western leaders. So popular is he among his people that he won the People’s choice for Time 2011 person of the year. But recently a push for a new constitution that would enhance presidential powers, a role that he would then likely try to take for himself, have also caused widespread public anger. As has the prosecutions of journalists and intellectuals – more journalists are currently behind bars in Turkey than anywhere else in the world, according to the Committee to Protect Journalists. When Erdogan swept to power in 2002, Turkey was lauded by the West as an example of a successful, Muslim-majority, secular democracy. The country’s brand of “Islamic Calvinism” – spearheaded by Erdogan’s pro-business and pro-free market reforms – lifted Turkey out of deep recession. If the economy is a crucial factor to the stability of a country, Turkey’s is badly placed to spark a revolution: It is soaring. The economy grew by 5% a year on average from 2002 to 2012. Turkey has avoided both the financial collapse of its neighboring European countries. The protests have spread to 67 cities, including the capital Ankara. Hundreds of thousands of people have taken to the streets. Many of the demonstrators are young, secular, educated men and women. They were largely peaceful. It is clear that the protests have touched a nerve for Turks across a broad social spectrum. Demonstrators have also received a lot of support from other sections of society. Many taxi drivers in Istanbul beep their horns in solidarity and older residents, even in some of the poorer parts of the city have come to their front doors, beating posts and pans in support of the demonstrators. Police initially cracked down heavily, seemingly hoping to smother the protests. They used teargas and water cannons aggressively, and hundreds of people were wounded. Amnesty International has condemned the crackdowns and claimed that two people have been killed. Realising that this was only serving to fuel greater dissent, Mr Erdogan admitted the mistake. Clashes have continued in other parts of Istanbul, but security forces have pulled out of the central protest area Taksim Square.